Best known for Bergenia cordifolia these tough perennials are suitable for use as a ground cover, or in the rock garden. We have all seen the pink forms however Bergenias offer a little more with Bergenia cordifolia ‘winterglut’ being red flowering. 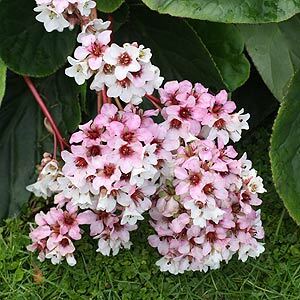 Prefering a humus rich well drained soil, if planted in heavy shade Bergenia will end up with lots of large leathery heart shaped hairy leaves or foliage, the more sun the more pink flowers and less leaves. Plant all species in semi shade to full sun for best results, they are not that fussy about soil types. Bergenia can do well as a border plant. B. cordifolia ‘Bressingham White’ or elephants ears has pure white flowers. B. cordifolia ‘Rotblum’ has dark pink flowers. These plants are great fillers in a semi shaded spot, very reliable. The more sun the better the flowers, however foliage will suffer a little in full sun in warmer climates. Popular species such as Bergenia Ciliata ‘Wilton’. B. cordifolia ‘Bressingham White’ or elephants ears and B. cordifolia ‘Rotblum’ are all great woodland plants. Bergenia x schmidtii is another cultivar worth considering. Bergenia ‘abdenglut’ has brilliant electric pink flowers with foliage that turns toward a deep purple in winter, a brilliant addition.